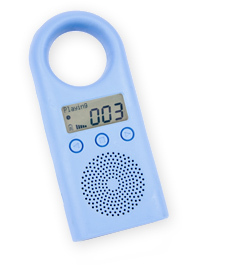 SweetPea3 ~ The MP3 Player Made for Kids! In this digital age, it’s not uncommon for kids to have one or more handheld devices by the time they’re in 1st grade. When is the right time to get certain items and which are best to suit the needs of a child? My kids both like listening to music in their room, yet I cringe when they yank the CD out of their CD player because I know it’s just not going to last very long in the hands of a 6 year old and 3 year old. Products for this age group need to be child-specific in order to last. I knew both kids would love an MP3 player (it would certainly make my life easier, and save my CDs) but I didn’t want to spend money on something that could easily be broken, or with tiny buttons even I wasn’t sure how to manipulate. Enter in the SweetPea3 MP3 player for kids! When we received our SweetPea3 MP3 player to review, I explained to my oldest that I needed to download some music into it first, which of course was met with an “awwwwwww!” whine. That is, until I realized that this MP3 player already comes pre-loaded with music from award winning artist Susie Tallman & Friends and Jim Weiss, award winning storyteller! Perfect! Off the kids went to enjoy the MP3 player while I learned more about it. I learned right away that the simplicity of the SweetPea3 MP3 player is what makes it a winner. The buttons are easy for little hands to control – right arrow for the next song, and left arrow for the previous song. Any button can be used to turn the MP3 player on or off, and you don’t have to worry about draining your (single AA) battery because it automatically shuts itself off after 1 minute without use. Another great feature – you don’t have to worry about your kids blowing the speaker on the MP3 player (which does not come with headphones, however, you can attach your own) because the volume control is completely hidden from kids and controlled only by parents (hooray!) Parents can access the settings by pushing the left and right arrow keys for 6 seconds. The settings area is where parents can access playlists and more, so no worry of your little princess deleting the entire menu either. The SweetPea MP3 Player comes with 2GB memory (32 hours or 700 songs at 128 kbit/s data rate), a USB cable for downloading music and stories (love that idea, it never occurred to me until now to download stories), and an AA battery. You can also purchase an AC Adapter for $9.95. Worldwide customers can purchase the SweetPea MP3 player directly online from SweetPeaToyCo.com for $59.95 USD or they can use the handy Where to Buy link on the site to find retailers in Canada that sell it as well (I didn’t see any in Saskatchewan, surprisingly!) The product comes with a limited one year warranty. Shipping within Canada is $9.95 USD (ships within 2-8 business days depending on your distance from Calgary) and $6.95-$9.95 USD within the US depending on your shipping preference (3-9 business days). Parents and others with little ones on their holiday lists don’t have to wait until the kids are older to enjoy the SweetPea MP3 player. It’s suggested for use in nurseries as well, as a small audio player, or for toddlers to listen to their favorite downloaded stories on when travelling in the car or out and about with mom. Others who could benefit from the ease of the SweetPea3 MP3 player include seniors and people needing help with fine motor skills. SweetPea3 has generously provided me with an additional MP3 player to give away to one of my lucky readers this holiday season! To enter, leave me a comment here telling me who you would like to win this for this holiday season. This giveaway will end on December 6th at 9PM CT . Giveaway is open to Canadian and US addresses.